Get 15% off Advanced Pass Sales until March 14th! 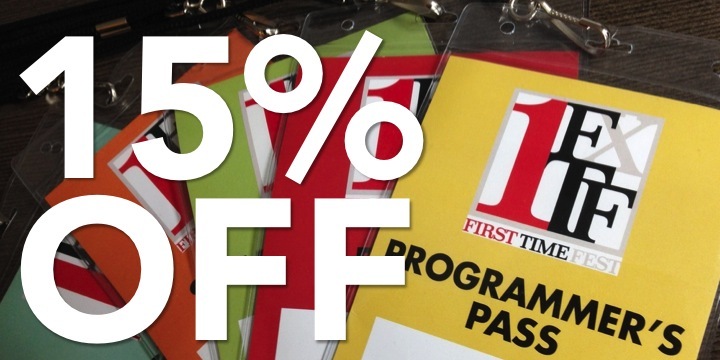 Passes for First TimeFest 2014 are on sale for a limited time only. Be sure to grab yours before the 2014 lineup is announced and everything sells out! We hope you will join us for First Time Fest - The Second Time Around. Remember: passes and packages allow you the best access to films, panels, parties, and more. Our most exclusive pass - enjoy ALL of the programs and festivities of FIRST TIME FEST! Opening Night Screening and Party, Closing Night Awards Ceremony, Screenings, FTF PRESENTS (Panels, Conversations, Tributes) and Access to our Filmmaker Lounge. This pass guarantees seating at all COMPETITION screenings, FIRST EXPOSURE screenings, STAND ALONE conversations, and HOW THEY DID IT panels (until 15 minutes before start time) at Loews Village VII Cinema and NeueHouse. This pass guarantees seating at all COMPETITION screenings and FIRST EXPOSURE screenings (until 15 minutes before start time) at Loews Village VII Cinema and NeueHouse. This pass guarantees seating at all FIRST EXPOSURE screenings, STAND ALONE conversations, and HOW THEY DID IT panels (until 15 minutes before start time) at NeueHouse.